Hull draft (with skeg) 18"
Steel hull components 9,000 lbs. Fresh water capacity 220 gals. Waste tank capacity 250 gals. 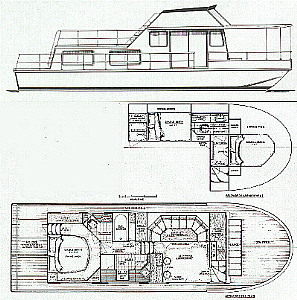 Hull type: Full length vee bottom hull with considerable deadrise and flare forward. Designed for double diagonal plywood on bottom and sheet plywood on sides (Plywood version), or sandwich cored "one-off" male mold fiberglass (Fiberglass version), or welded sheet steel hull construction (Steel version). Power: Twin long shaft outboards or inboards with sterndrives, gasoline or diesel. Drive systems should have "power trim" capabilities. Single outboard or inboard optional if boat primarily intended for stationary use.